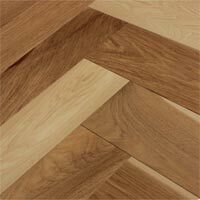 For years it took time for builders, architects and hardwood professionals to accept the use of engineered hardwoods particularly on jobs with plywood over floor joist systems. The traditional method had always been solid hardwoods, but that was a time when 2 ¼” strip flooring was the mainstay in residential construction. Strip floors don't show problems as much as wider plank floors due to seasonal movement in relation to humidity levels. Wider plank solid hardwoods are more prone to problems associated with changes in moisture with typical home construction of today. More easily understood, they cannot perform as well as engineered with seasonal change, unless the home is climate controlled (maintaining balanced moisture levels) in its entirety, which also includes basements and crawlspaces; areas many don't focus on. In laymen’s terms, rippled and buckled floors come to mind. In professional terminology, cupping and tenting is typically the most problematic condition. Homes With Basements. The Big Issue! Basements and crawl spaces, or more important the ambient humidity levels, create the majority of problems with new hardwood floors. This is best explained with the video below. Acclimation alone will not prevent problems with solid hardwoods. What is not recognized is the importance of climate control within the home, particularly basements, crawlspaces or what’s under the new floor. First off they are not barriers. They never have been. The National Wood Flooring Association (NWFA) recommends moisture retarders in the form of asphalt felt paper or a newer product called Aquabar. When we consider nailing hardwood floors punches hundreds of holes in this “protective barrier” it’s obvious the barrier has been compromised. This is one reason for the term moisture retarder. 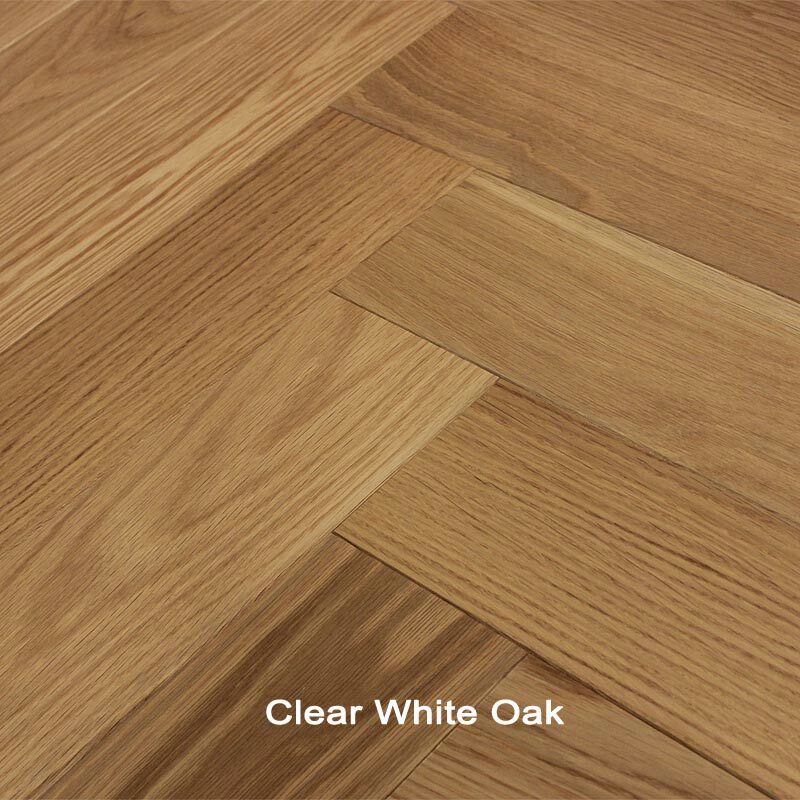 Due to our heavy 5.2 mm veneer or what many call the wear layer, this type of engineered can be refinished as many times as a solid hardwood floor. Other thinner veneer products on the market today mention the same, but in reality, it is not often possible. Your average flooring store doesn’t even know this type of product is out there, but they will soon. It’s only been available exclusively through Uptown Floors for two years. 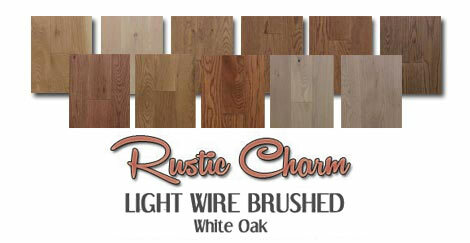 Best yet we offer a multitude of prefinished colors and styles with many board width options. But I Don't Want Engineered Dangit! I Want The Real Thing! 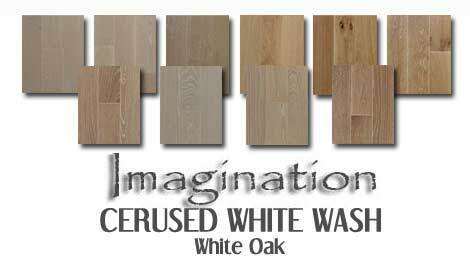 Most people do not think an engineered floor can be refinished as many times as a solid hardwood floor. Sure, those products with thin wear layers cannot. 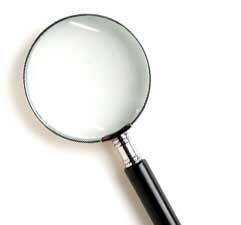 This can include practically any product seen in showrooms across the USA. 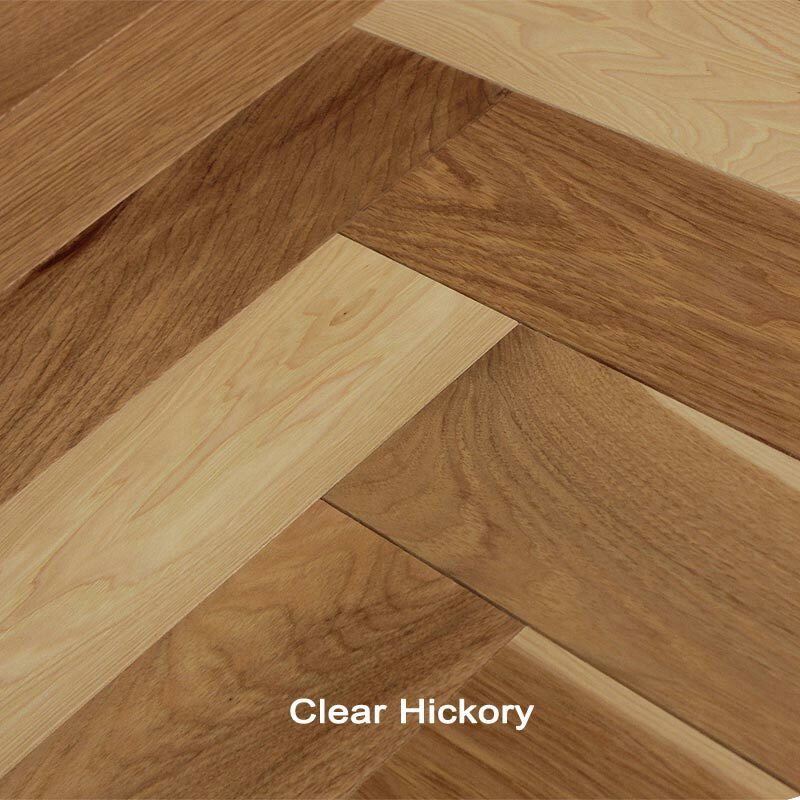 Our thick 5.2mm wear layer product equals the longevity of traditional solid 3/4 inch hardwood floors. For nailed installations it's all about the nails. Maybe you've seen it before. Let's say both products shown above have been sanded four times. 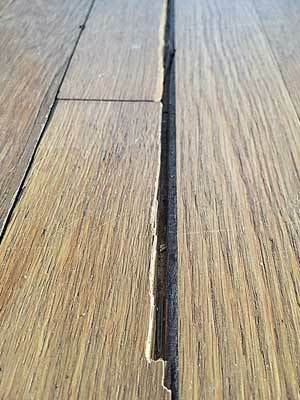 What often happens with solid hardwoods is the nails used to install begin to show or the top of the groove becomes so weak they split and fall out. Obvious with the example shown. 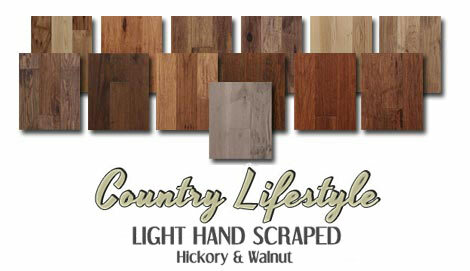 There are special types of hardwood flooring nails, often called cleat nails. And there are staples specially made for this purpose as well. For all intent and purposes whatever you may be working with, cleat nails are preferred by most professionals. 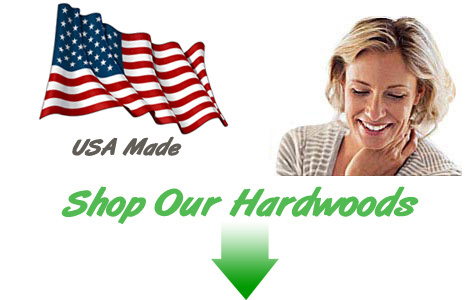 We do not specify nor warrant our 3/4" hardwoods installed by a staple down method. 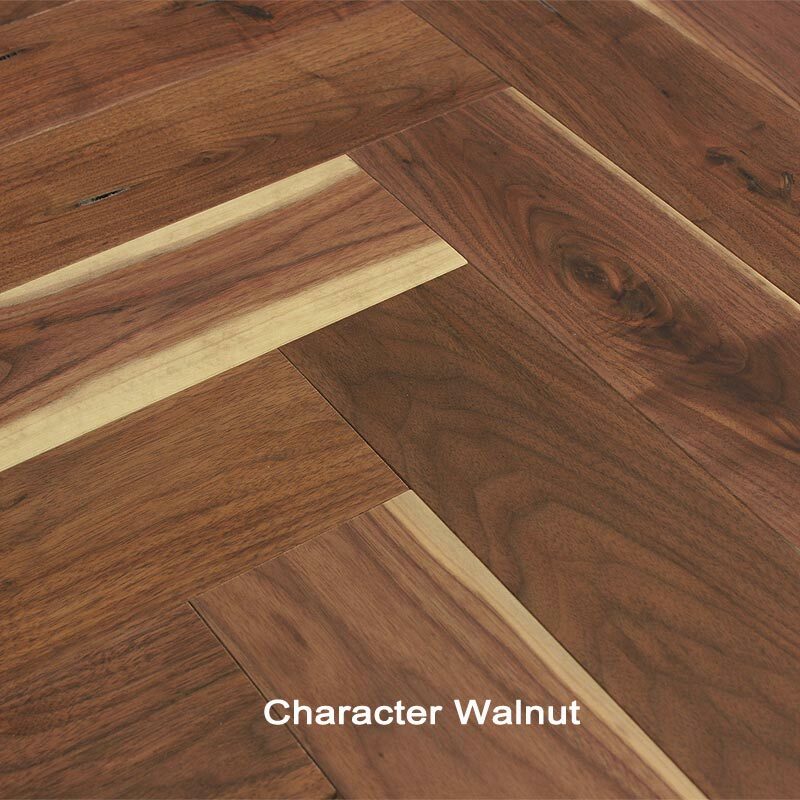 Solid hardwoods are not specified for concrete installations unless a plywood subfloor is installed first. Engineered are often glued direct to concrete slabs with specific adhesives. 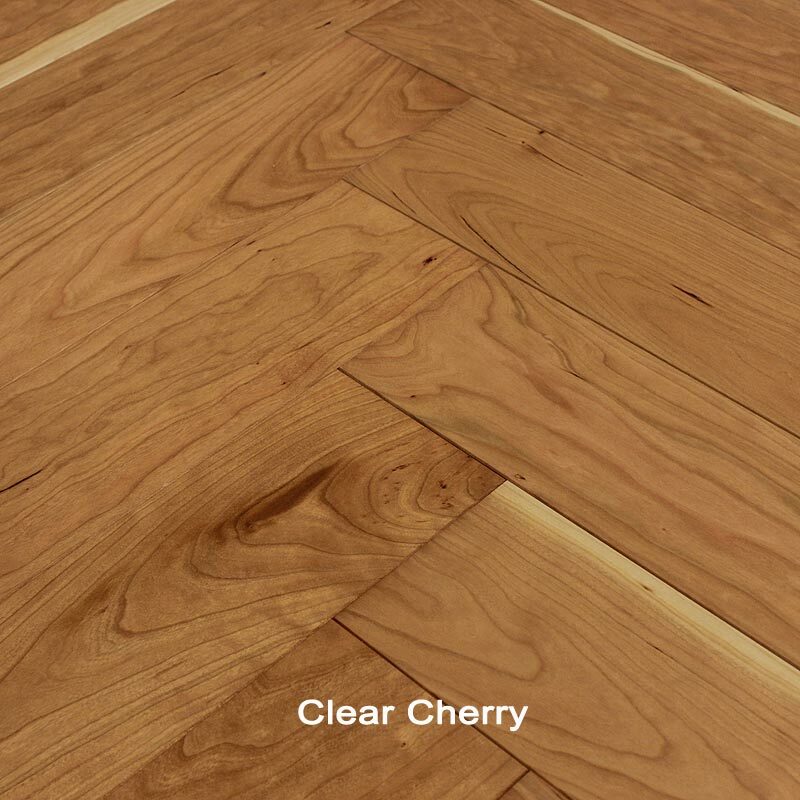 There are no differences in the longevity or how many times our 3/4 inch engineered hardwoods can be refinished mentioned with the comparison above. If you're the type that insists on 'the real thing' it is critical you know what problems you can encounter with wide plank solid hardwoods. The video above explains it best, particularly for those with basement or crawlspace home construction. 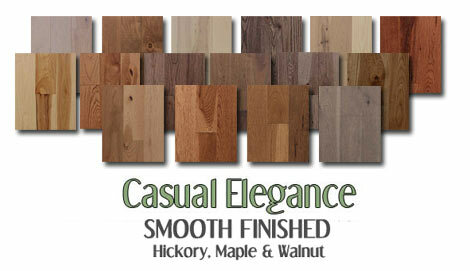 Maybe you've noticed there are a lot of prefinished manufacturers that offer short length engineered hardwoods. This was very common in earlier years and still is with several of the older companies. 12 inch to 42 or 48 inches long doesn't fit nicely in large open areas. Granted, few will take notice, but once you get into wider planks they will stand out measurably due to the increased number of seams or bevels. Thicker engineered hardwood flooring is replacing older methods of installing solid hardwoods on concrete compared below. 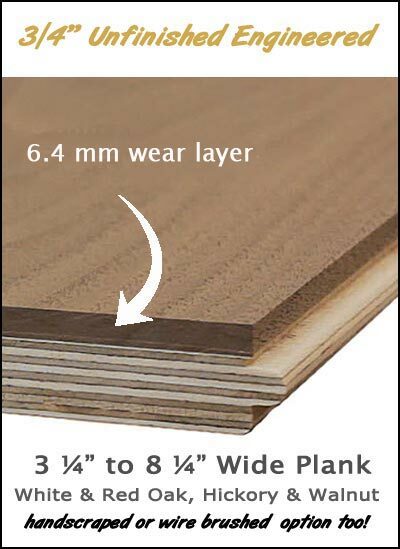 Considering the large demand for wider plank flooring today, it’s also becoming the norm or a more reliable method for use on wood sub floors as well. Although some will always prefer solid hardwood and nothing else, examine the below scenarios when it comes to older methods of placing solid ¾ inch hardwoods on concrete. Keep in mind, gluing solid hardwood direct is risky business, regardless of who you hear it from. 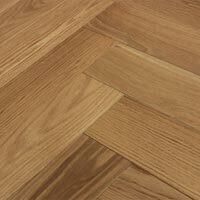 Exceptions can include shorter length solid material for herringbone and chevron designs as an example. 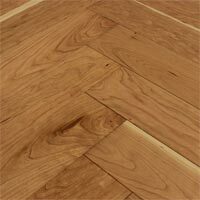 Thinner solid hardwoods are also acceptable as are short length ¾ inch hardwoods, but unless the home is climate controlled 52 weeks out of the year, expect some minor gapping during extended dry periods. Examined in this scenario is a typical plywood installation that creates a nailing base for solid hardwood. 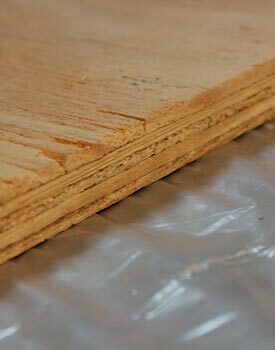 The first step after proper floor preparation and moisture testing is bringing in ¾ inch plywood.¹ Costs today run in the $ 1.25 per square foot range for CDX grade which does not include contractor markup. Moisture barriers, fasteners and labor to install may run anywhere from $1.25 to $ 2.50 per square foot depending on where you live. In this example I'll use $ 2.00. Once that’s all said and done, it’s time for the actual hardwood installation. 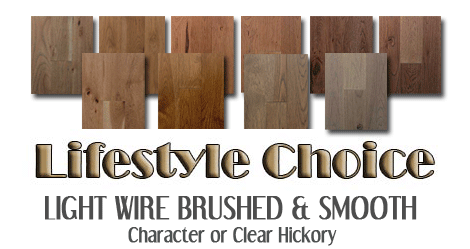 I’ll use $ 3.00 per square foot for prefinished hardwood as it satisfies a national average. California, Washington State, Minnesota? The number could reach the low to mid four dollar range. Final costs of installing a nail down floor on plywood over concrete; $ 6.25. This figure is based on three items. For ¾ inch engineered on concrete, the first step after proper floor preparation and moisture testing² is choosing adhesives and or moisture barriers. Moisture barriers come in the form of troweled products. A previously popular two step system (still used by many) called for a separate barrier that was spread one day and the hardwood installation the next with the actual adhesive. The two step process is changing as adhesive manufacturers have developed two in one or three in one options that offer a moisture barrier and adhesive in one. Also called multi use, two in one offers the moisture barrier and adhesive properties where a three in one adds another component; sound control. For all intent and purposes the two in one is included in this example. It’s fairly straight forward. One of the most popular systems used today is the Taylor MS Plus Advance that comes with its own special glide on trowel. The difference here compared to standard trowels is the design allows for a proper moisture barrier membrane. Spread rate from Taylor is recommended at 30-35 square feet per gallon using their glide on trowel. Costs translate to about $ 1.05 per square foot based on a $145 per four gallon container. Labor costs for the actual installation follows what we saw above or $ 3.00 per square foot. 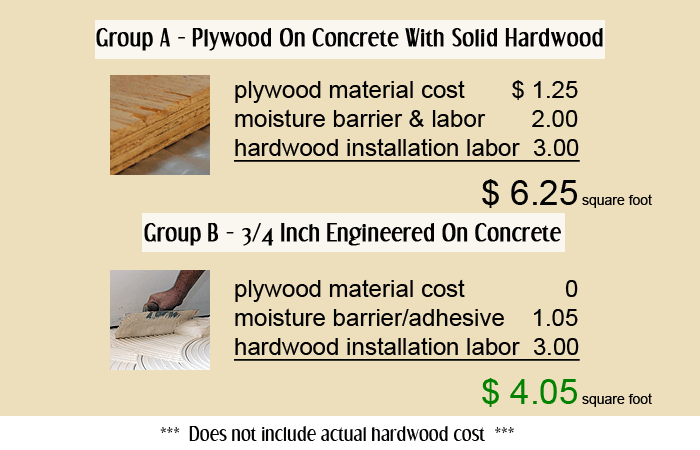 Final labor and material costs for gluing a ¾ inch engineered to concrete; $ 4.05 per square foot. Let’s say the job entails 2,000 square feet with a foyer, hall, kitchen, dining and great room. Depending on the number of installers on the job, time will vary. When I handled plywood on concrete alone, a job this size would have taken five days and that was pushing it. Angled walls, kitchen nooks and the like always takes more time. In this scenario without plywood, the five day period does not exist. 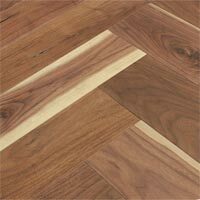 For the actual hardwood cost there is a variance but it can depend on what species of hardwood. 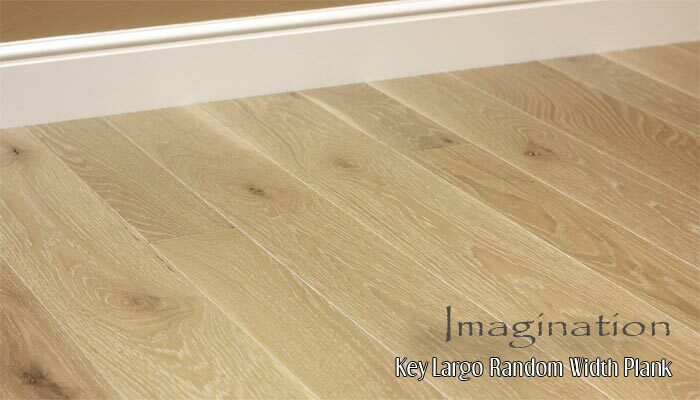 I’ll use our Imagination Key Largo random width (offered up to 8 ¼ inch width) as an example. The cost advantage still goes to the ¾ inch engineered at 12 % less once it’s all said and done. Adding ¾ inch plywood and a ¾ inch solid hardwood floor was often done in new construction before cabinets, appliances and baseboard. There were few elevation problems. In any remodeling phase, with all mentioned kept intact, a slew of issues come to mind including doors that may need trimming. In some cases, older entry doors had to be replaced as trimming was not an option, unless the threshold was raised. Even more, some metal doors needed complete replacement. 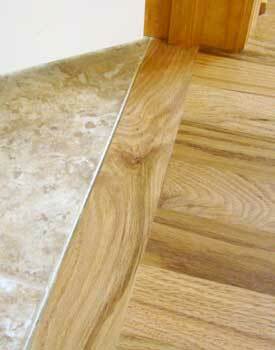 Appliance clearance is another issue and baseboards with lower profiles. The labor costs exampled are contractor only pricing and not retail store. Issues to consider with high end ¾ inch engineered are lack of common trim moldings. However, they are designed more for higher end where trim moldings are rarely used anyway. Planning is important when it comes to tiled areas that connect where a common T-Molding would find it’s place. 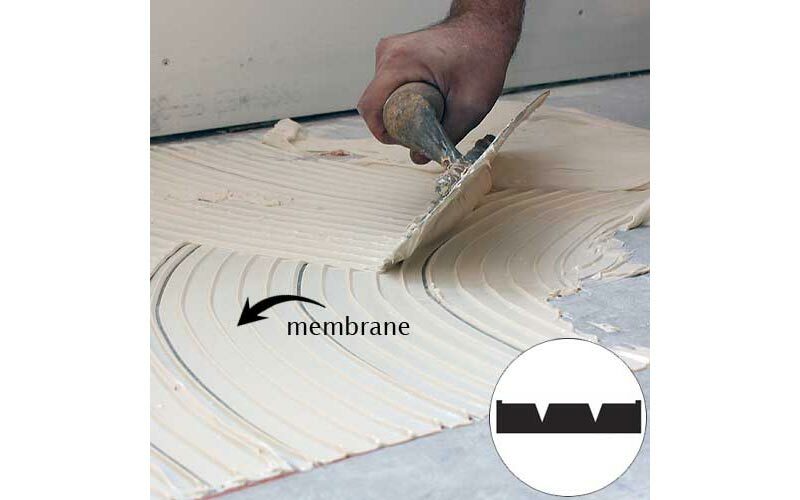 In cases like tile, the finished vertical height has to be brought up to meet flush with the hardwood while still leaving some expansion space (silicone caulk) shown with the illustration. This can be accomplished with cement backer board (common) for those with wood sub floors up north. For concrete sub floors, the same can be used or building up the tiled areas with a floor leveling compound. Carpeting connecting to hardwood is not an issue as shims made specifically for ramping carpet can be used underneath to slope ever so gradually to meet the ¾ inch thickness. In reality it’s not often this type of shimming is necessary especially with thicker pile carpeting. If you should happen to have instances where a custom molding is needed, our hardwood manufacturing community source can handle any conceivable scenario. 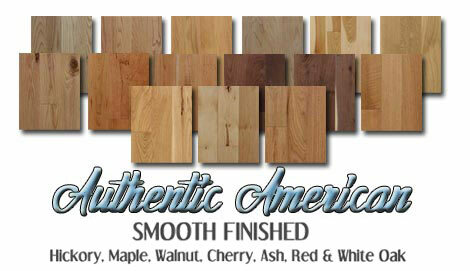 All custom moldings (including stair treads) are also finished with your flooring, guaranteeing a color match. As wider plank hardwood popularity began changing what goes in new homes, most just assumed if all the precautions were taken, solid hardwoods would be fine. Precautions were taken in the form of nailing and gluing planks four or five inch and wider to wood sub floors. While this procedure is still being used today it still does not guarantee eliminating problems associated with wider plank floors. To better understand the acceptance of engineered floors we have to go back 30 and 40 years, even longer. Years ago homeowners looked at solid hardwoods as a floor to walk on. Cracks and gaps weren’t obsessed over; they were part of the floor. Now floors are being viewed very differently. Some have placed expectations too high, due to the way hardwood floors are marketed today. Wider plank solid hardwoods are actually fine to use, but they need near perfect environmental conditions to remain the way they looked after the installation. 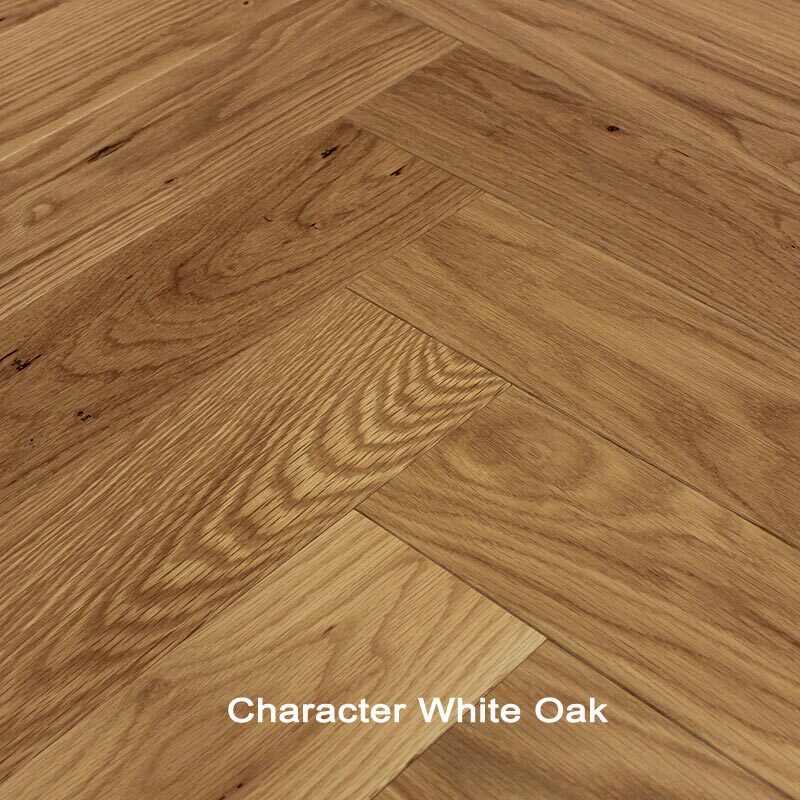 Exceptions can include true quarter sawn floors, but even they will have minor issues if the home goes through extreme and prolonged dry (heating) or humid conditions. ¹ Acclimation of plywood can also play a role in the performance of solid and engineered hardwoods. ² It doesn’t stop there. Awareness of potential moisture problems should be examined. 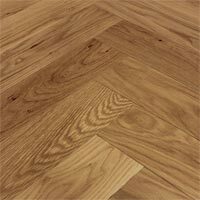 Uptown Floors also offers herringbone or chevron patterns with all product selections shown on our site. Lead time may increase over the general 5-6 week time.